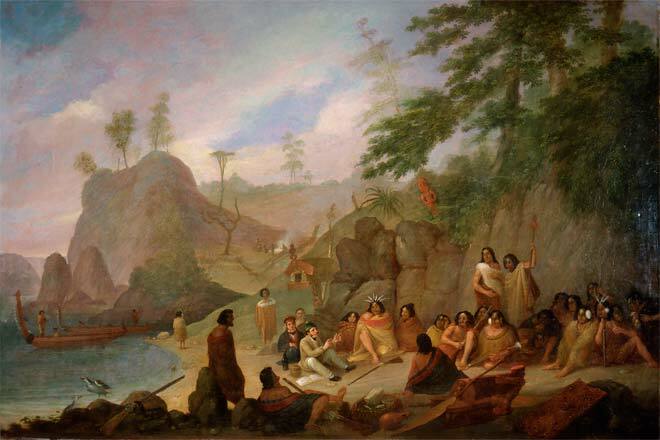 This 1827 painting by Augustus Earle shows Ngāpuhi leader Hongi Hika (centre, wearing huia feathers in his hair and a light-coloured cloak) at a meeting near Kororāreka. He had been hit by a musket ball during a battle and injured. Unfortunately he had not worn his suit of armour, a gift from King George IV, which had until then deflected musket fire. Hongi's wound was ultimately fatal – he died the following year.